Toddler climbing out of crib is often a challenge for parents. While some babies are just happy to play or sleep in their cribs, others are more interested in climbing out of the crib all the time. 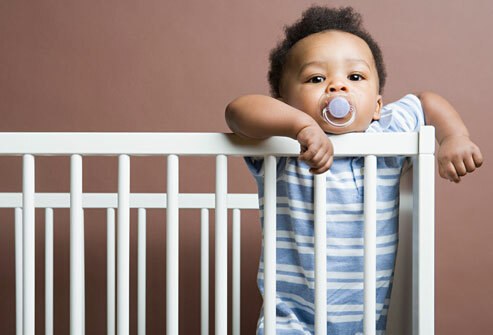 Usually, most toddlers begin climbing their cribs at the age of 16 to 18 months. Although some of them get scared when they fall, others will continue to do that. To keep your baby safe, making a plan with tips served in the article will help you cope with this transition period easier. Toddler Climbing Out of Crib, Is It Normal? Although it is common for some babies that they want to get out of their cribs, you should not ignore this problem or consider it as just a phase that she will outgrow. If your toddler is doing it regularly, she may be facing some risks of getting hurt from a fall. In addition, if she does this at night, she may wander, and this may be dangerous, especially if your house is not toddler-proofed. Find out if your toddler's escapades are due to some sleeping problems, which makes her want to always get out of her crib. You must then try to find a way to improve her sleeping habits, as well as stop her from climbing out of the crib. Use a lower mattress. Try moving the cot's mattress to the lowest position to prevent your baby from climbing out. This works only for smaller babies, but not when they get bigger and older. Empty the crib. Your toddler may be using her toys or the cot bumpers to help her climb out. Remove them to prevent her from using them as levers to get out. Don't react to her behavior. When your child climbs out of the cot, do not react by giving her more attention or letting her lie in bed with you. This will make her keep doing it. Stay calm, but firmly tell her not to do it again, putting her back in the cot. Watch her. Stand and watch her in a place that she cannot see you. When she tries to climb out, tell her immediately not to do it. After doing this a few times, she may learn to stay inside. Keep her safe. If you cannot keep her from climbing out, at least keep her safe. Place some pillows and paddings on the floor around the cot, as well as some on nearby objects that could harm her. Alternatively, you can lower the side of her cot and place a stool next to it, so that you don't have to worry about her falling. If your toddler demonstrates that she can easily climb out of her crib, stop using the crib. Many children break their arms and legs from falling off a crib while attempting to escape. If your toddler is potty-training already, stop using the crib. When you are training her to pee when she needs to, she has to be able to have some independence to go to the bathroom. When she is ready to abandon using diapers also indicates that she does not need the crib anymore. Children who are about three years old and never climb out of their cribs may be allowed to try sleeping on their own beds or floor mattress. Talk to your child about it and help her to get ready for the big change. Another sign that it is time to shift your toddler to a floor mattress or child bed is when you or the caregiver cannot lift the child to go in or out of the crib. You can also use a child bed with rails when your toddler is over one year old, but take care that she does not escape.